Why: The views of Médano Beach and the entire coastline from Cabo San Lucas to Punta Ballena are spectacular. This gorgeous beach is framed by evocatively eroded granite rocks that date to 30 million years ago. The neighboring Divorce Beach is equally beautiful and accessible by walking through a gap in the rocks to the Pacific Ocean side. When: Lover’s and Divorce Beaches are lightly populated in the morning, and both are perfect spots for picnic brunches. You’ll have to pack your own supplies, however. 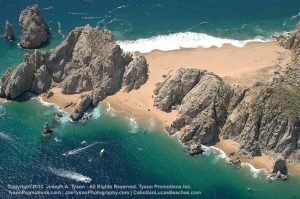 Where: Playa del Amor is located on the half-mile Land’s End headland, and it is only accessible by water. Water taxis (called pangas locally) are the cheapest transportation option. Warning: While safe swimming and excellent snorkeling are available off Lover’s Beach, visitors should avoid the water on the Pacific Ocean side due to strong rip currents. Behind the arch, spanning Cabo San Lucas Bay and the Pacific Ocean, Lover’s Beach affords a unique opportunity to swim and snorkel in the bay and admire the crashing waves on the Pacific side (Divorce Beach to locals), where swimming is very dangerous. This awe-inspiring, secluded beach is not to be missed. 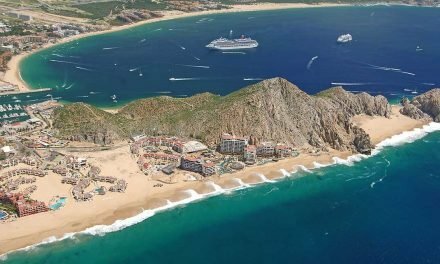 There are no services available on Lover’s Beach and access is only by water taxi or glass bottom boat from the Cabo San Lucas marina, and from Médano Beach, where kayaks are also for rent. Once known as Playa de Doña Chepa, Lovers Beach is another must, but to get to this hidden cove you’ll need some kind of floating transportation. Easiest is to hire a water taxi at the marina. 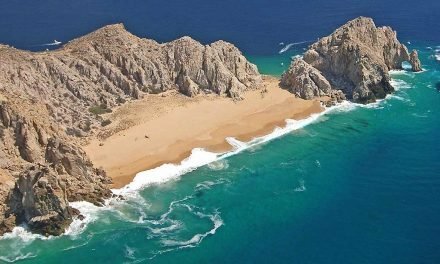 The captain will take you on an informative tour of the diving areas around the arch (El Arco), point out Lovers Beach, then go around the popular point for a wonderful view of the dramatic area where the Sea of Cortez meets the Pacific Ocean. 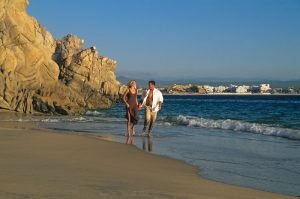 Couple walking along the bay side of Lover’s Beach, Cabo. We suggest you pack a lunch of your choice, some water and plan on spending the better part of the day enjoying Lovers Beach and the striking wind and water shaped rock formations. Ask your skipper to come back for you at a pre-determined time…all for one price. Be most careful here, the powerful waves and currents of the Pacific make swimming quite dangerous. 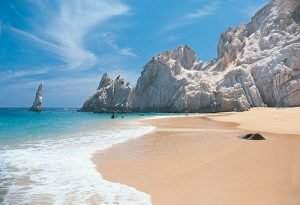 Swimming and snorkeling should only be attempted on the Sea of Cortez side of Lovers Beach. 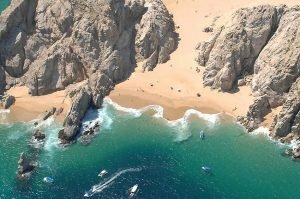 Playa del Amor or Lover’s Beach in Cabo San Lucas, with Divorce Beach in the background. 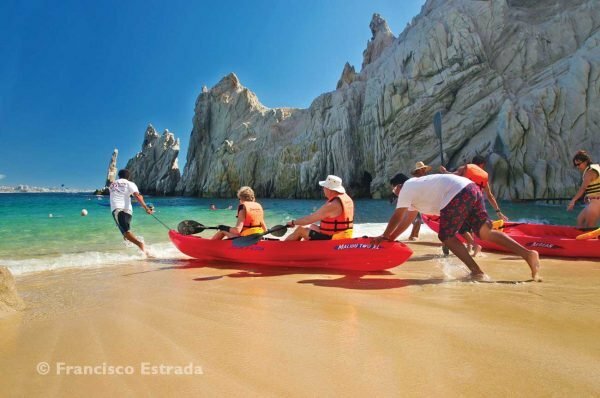 Cabo San Lucas is world-famous for the breathtaking spectacle at Land’s End as well as Playa del Amor (Lover’s Beach). One really hasn’t been to Cabo until one stands near the arch and feels the incredible forces of nature and its beauty at work here. You will be impressed by the towering majesty of the rock formations, the caves, Lover’s Beach, and the clear azure tropical waters. 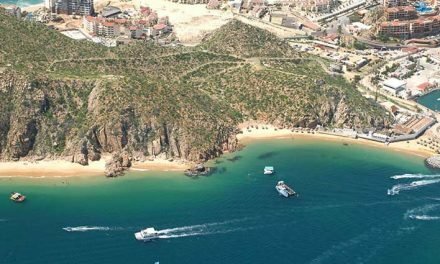 There is great snorkeling on the bay side, running from Lover’s Beach to the marina breakwater just outside the entrance to Cabo San Lucas harbor. This marine sanctuary is great for viewing a wonderful variety of colorful tropical fish as well as game fish. So have a mini-adventure—rent snorkel gear, take a water taxi—be sure to arrange your return trip as well—to Lover’s beach, explore, snorkel and enjoy.